As the recent failings in the VA’s EMR network indicate, even the most lauded systems can fail at times. 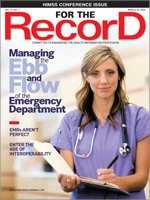 In January, the U.S. Department of Veterans Affairs (VA) made headlines when software glitches in the department’s electronic medical record (EMR) raised concerns about patient safety. Rep Bob Filner of California, chairman of the House Committee on Veterans’ Affairs, came forward saying he would investigate the errors that, according to the Associated Press, caused incorrect doses of drugs to be administered and treatment delays. While the VA stands behind the computer system that managed more than 1.6 billion transactions in 2008, the event has garnered plenty of media attention and caused heads to turn in the industry. The glitch affected medical data pertaining to items such as vital signs, lab results, and active meds, according to Associated Press reports. Findings suggest that information would pop up under the wrong patient’s name on the computer screen, and some records failed to display a physician’s stop order for a treatment. As of February 20, there had been no reports or evidence of patient harm, but the glitches, which began in August 2008 after upgrades were initiated for the system and lingered until December of last year, were not disclosed to patients, leading to some distrust in the government and medical communities. Lack of disclosure was found for errors such as Heparin—a drug that can be life-threatening in excessive amounts—infusions for up to 11 hours longer than necessary. Having errors occur in an EMR system is certainly not something new—or indigenous—to U.S. health systems. A Mytob worm attack on the network of Barts and the London NHS Trust last year caused the organization’s “major internal incident” plan to activate. Considered one of the most severe network failures to have occurred at an NHS hospital trust, the event caused some ambulances to be redirected. An interim report on the incident says clinical services were affected, and the protracted delays in getting the network back up created potential risks to patient care. In November 2007, two female patients were scheduled for CT scans at a Dominican Republic hospital. Because of the test results, the first patient underwent an unnecessary appendectomy that evening. A radiologist later discovered the patient’s CT scan was actually that of a second patient. The error was caused due to software incompatibility between the system used by radiology and that of the scan room, an issue that, according to The Joint Commission, should become a major focal point in HIT implementation projects. While the VA foul-up is not the first time there has been a software glitch associated with an EMR that affected patient care, the intense scrutiny of the event may be associated with the fact that it’s the first time an error has occurred over an extended period of time with definite impact on patient care. According to Annecharico, the fact that the VA has also experienced problems with the losses of sensitive data may be a factor and may have exacerbated the situation. But, she says, the VA should be given credit for being a leader in the EMR movement, as it currently boasts one of the largest and most robust systems to date. In 2006, the U.S. Pharmacopeia MEDMARX database contained 176,409 medication error records, 1.25% of which resulted in harm. It is estimated that approximately 25% involved some aspect of computer technology as at least one cause of the error. Currently an issue at the forefront of the medical community, medication errors and concerns over patient safety are expected to continue to place the HIT movement under close observation. Pointing out that errors are more likely to occur and are more difficult to fix under manual processes, Christopher notes that HIT has to mature at an extremely quick rate to overcome the potential for errors, as well as alleviate skepticism and create unity. Jane Horowitz, chief operating officer of the National Alliance for Health Information Technology, points out that the VA has been doing a relatively good job in the area of medication error improvements. In fact, it has seen its error rate improve between 85% and 87%. Nationally recognized standards are expected to enable the flow of information reliably, consistently, accurately, and securely, providing a foundation for how data are managed. Horowitz says that there are also other areas addressed in the bill, such as the formation of a standards committee that will give the national coordinator recommendations on standards, implementation specifications, and certification criteria that they develop, harmonize, or recognize as harmonized by another entity. In 2002, the Institute for Safe Medication Practices and the Pediatric Pharmacy Advocacy Group issued pediatric pharmacy medication safety guidelines designed to reduce the incidence of medication errors among children. In 2004, The Joint Commission adopted recommendations from the institute’s list of look- and sound-alike drug names for use in its National Patient Safety Goals. In that same year, a national hazard alert was initiated by the institute for the immediate, nationwide replacement of Brethine (terbutaline) ampuls with available vials to avoid potentially fatal mix-ups with look-alike ampuls of Methergine (methylergonovine). These policy and program changes are just a tiny sampling of what one organization’s medication error reporting database and initiatives have accomplished, according to Michael R. Cohen, RPh, MS, ScD, FASHP, president of the Institute for Safe Medication Practices. It’s no secret that medication errors have been at the forefront of the national healthcare scene for a number of years—with good reason. FDA statistics suggest that more than 770,000 Americans are injured each year due to medication errors. In light of the recent software glitch within the VA’s EMR system that resulted in medication errors concerning a number of patients over a period of several months, attorney David Szabo of Nutter McClennen & Fish suggests that organizations need to think about how to use medication error reporting in a productive way that causes cultural change and process improvement. Szabo cites the 1994 case in which a breast cancer patient at Boston’s Dana-Farber Cancer Institute died after receiving toxic doses of chemotherapy drugs. He says the error was not uncovered until a clerk found it while doing routine research of the patient’s stay. A media storm followed, but Szabo says the tragedy eventually became a culture-changing moment for Dana-Farber, which today ranks as a national leader in patient safety.